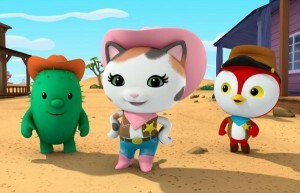 Sheriff Callie’s Wild West is a new CGI animated TV series for preschool kids, coming soon to Disney Junior. Starring the voice of Mandy Moore (Tangled), it tells the story of Callie — a calico cat, the loyal and heroic sheriff of a little western town called Nice and Friendly Corners — and her friends and associates as they learn important little life lessons. There’s an article at Entertainment Weekly that includes a preview video of the show. Sheriff Callie’s Wild West is available now at WATCHDisneyJunior.com and the WATCH Disney Junior smartphone and tablet app. It debuts on the Disney Channel and Disney Junior in early 2014.